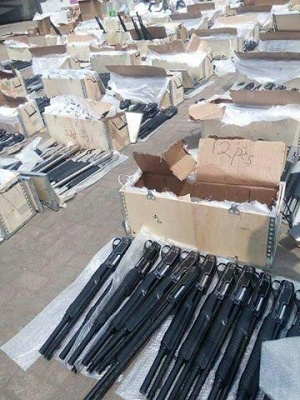 The Nigeria Customs Service has handed over the 661 pump action rifles seized on Sunday 22rd January 2017 by the Roving Team of the Federal Operations Unit Zone A Ikeja to the Department of State Security for further investigation. 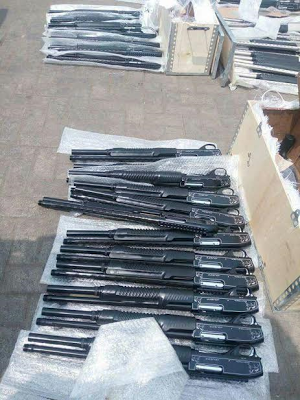 It will be recalled that the rifles were laden in a Mack truck with registration number BDG 265 XG conveying a 1x40ft Container with Number: PONU/825914/3 before it was intercepted along Mile 2 Apapa road, Lagos. 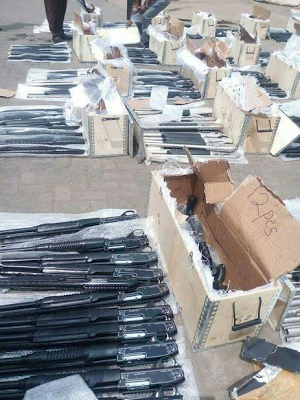 The truck was immediately taken to the premises of FOU Zone A, Ikeja where Physical examination revealed 49 boxes containing a total number of 661 pieces of pump action rifles concealed with steal doors and other merchandize goods. Mr. Sadique Mustapha (accompanying the consignment to its destination) age 28. 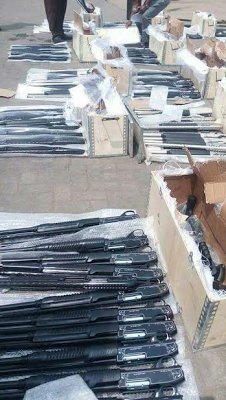 While handing over the 661 pump action rifles and the two suspects (Mr. Oscan Okafor (Importer) and Mr. Mahmud Hassan (Clearing Agent) to the Director-General, Department of State Security, Mr. Lawal Daura represented by the Director, DSS, Lagos State Command, Ms Betty Adoki, Deputy Comptroller General of Customs in charge of Enforcement, Inspection and Investigation, DCG Dan Ugo on behalf of the Comptroller General of Customs, Col. Hameed Ibrahim Ali (Rtd), calls on all well meaning Nigerians to support the service with necessary information that could assist the Service perform their statutory responsibilities better.